O Magazine O List Pick. 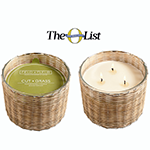 Hillhouse Naturals Cut Grass Handwoven 3 Wick candle was chosen as May 2017's 'O Magazines' O Pick List. Hillhouse Naturals Cut Grass Handwoven 3 Wick candle is the perfect home fragrance for the person who loves citrus-based perfumes and colognes.